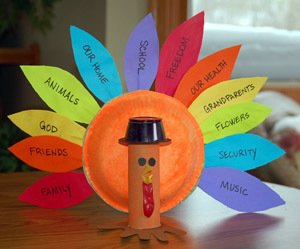 Here's a really colorful Thankful Thanksgiving paper bowl turkey craft. Use paper bowls, a toilet paper roll and colorful paper. Make a handprint for the base. Follow the link for the full, step by step tutorial on this great Thanksgiving craft.